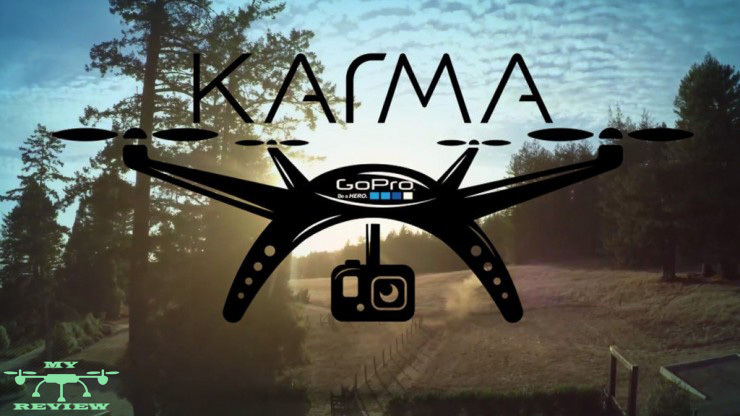 GoPro the famous company launched with GoPro Hero 5 his new drone The GoPro Karma. 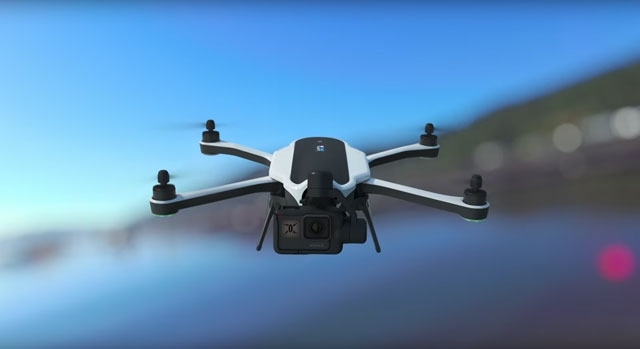 GoPro Karma is the first competitor of Dji Drone "Inspire, Mavic and Phantom". The Karma drone can fly with the new Hero 5 Black, Hero 5 Session, and Hero 4. At the front of the drone there’s a 3-axis gimbal that stabilizes the cameras for smooth footage, and this gimbal can also be removed from the drone for handheld use — an idea that Chinese electronics company Yuneec included on its Typhoon drone. 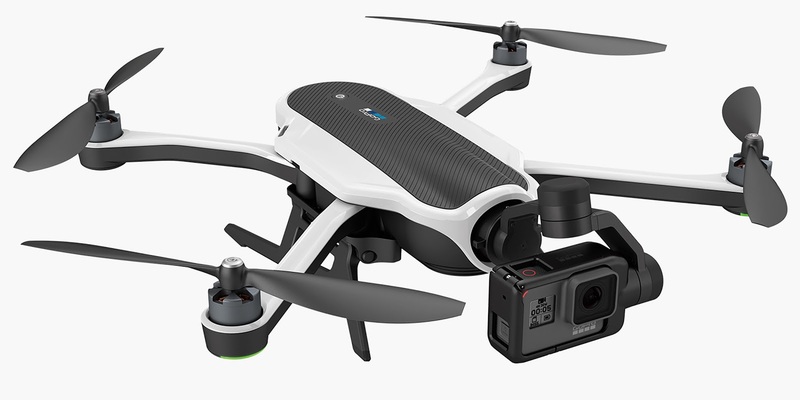 The new GoPro Karma drone costs £719 / US$799, and comes without an in-built camera. If you want to buy the GoPro Karma together with a camera as a bundle, you can get it with a GoPro Session for US$999 or the new GoPro Hero5 Black for US$1,099. 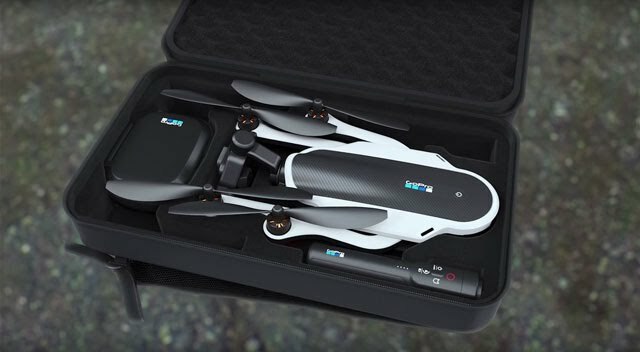 The GoPro Karma has four arms (one rotor on each) that can folded flat against the drone's body for easy transport in a backpack. It also features a three-axis gimbal for stabilising video, and the camera suspended in front of the drone so that the propellers are not in view. Excitingly, the gimbal can be remove for attachment to the included handheld Karma Grip, which features camera control buttons (shutter, filming modes and angle of gimbal) and delivers stabilized footage when used with the gimbal. You can attach the gimbal rig to other mounts too, which is handy. What comes in the box depends on whether you need a GoPro. If you're buying a bundle that includes a Hero5 camera, you will save $100 versus buying it and the Karma individually, which isn't bad. All the bundles come with the following: a Karma drone, six propellers, a touchscreen controller, the hand-held "Grip" stabilizer (also called a "gimbal") and a backpack to hold it all. There is also a charger with connectors for the batteries as well as USB Type-C, so you can simultaneously recharge the drone and the controller or Grip (or anything else powered by USB-C). With a Hero5 Black bolted into the gimbal, the Karma shot some spectacular stills and video.You can now even cancel the Hero’s fish-eye effect by choosing the linear-view setting in the shooting mode menu. This really helped grab wider aerial shots that looked great on an HD screen. The 12MP sensor did a great job of handling exposure, snapping some crisp, color-rich shots not only in daylight but even after the sun went down. The RAW and wide dynamic range (WDR) modes let you further tweak around with your pics to really make them pop in post-editing. "Related: Dji Mavic Pro Review: The Greatest Drone Or Just A Joke!" Video stabilisation is handled supremely well, allowing you to shoot professional cinema-like shots without a fuss - even if you still need at least some talent to get a truly jaw-dropping result. 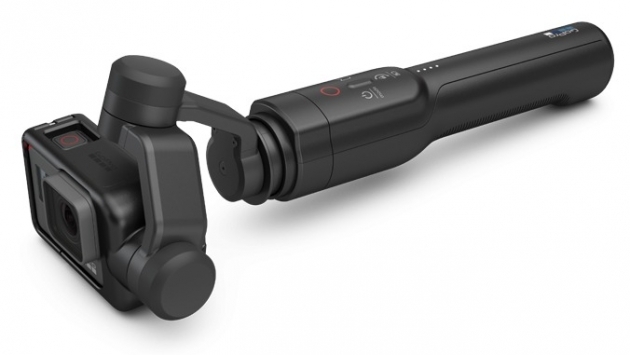 The Hero5 Black might be a natural fit for the Karma, but you can stick a Hero5 Session, Hero4 Black or Hero4 Silver into the gimbal if you’ve got one already. Simply put, flying the Karma is bit boring. There’s no drama or fuss or nonsense in using the drone. It just works and works well. The Karma flies smooth and level. It’s not darty, though it can quickly turn and change directions. In the air, the Karma feels like a sport utility vehicle rather than a hot hatchback. It takes just a minute or two to unpack the drone and get it into the sky. This is where the Karma stands apart from competitors. After removing it from the case, the prop arms and landing gear swing into place. Hit the power button on top of the remote and once the drone connects to GPS (this takes about a minute) it can be launched. This simplicity is the Karma’s main draw: take it out of its case and it’s flying a minute or two later. Both taking off and landing is done through dedicated buttons. Pilots are not required to connect a smartphone to get a point-of-view video feed, and there’s no learning curve with the Karma. In the air, the drone is smooth and predictable. Let go of the controls and it hovers in place, though not as well as other drones. The Karma tends to drift around a bit when hovering — not a lot, but more than other new drones. Mash the control sticks and the drone responds without hesitation. The Karma has no problem flying mere inches off the ground or rapidly changing directions though I find the Phantom drones a bit more agile. The Karma tops off at 35 mph, which is faster than older drones, but a bit slow compared to other drones just now hitting the market. Range is not an issue with the Karma. Its maximum flight distance is 3,000m, which in most cases is far enough for the pilot to lose sight of the drone, breaking one of the key FAA rules of piloting a drone of keeping the drone in visible range. However, many other drones available around the Karma’s price now have a range of 5,000 meters or farther. The Karma is easy to fly thanks mostly to the controller. It’s great. 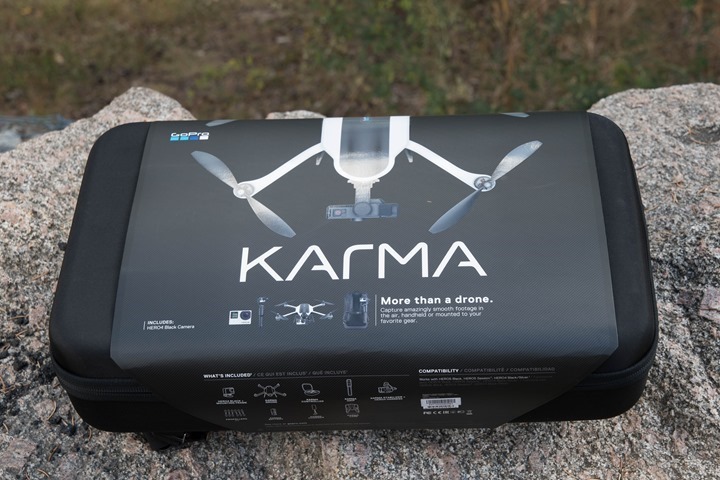 The Karma comes with the best controller of any drone TechCrunch has tested, and both experienced and novice pilots will appreciate the built in screen, ergonomics and ease of use. The controller is packaged like a portable game system. Flipping up the lid reveals a large LCD screen and controls. Camera controls are mounted on the shoulders making for a natural control scheme — flight controls are done with the pilot’s thumbs and the camera is controlled with the pointer finger. This controller is one of the reasons I like the Karma so much. The built-in screen means pilots do not have to hassle with connecting a phone or tablet to the drone or controller. Just flip up the lid and start flying. The battery is one of the Karma’s weak spots. It’s massive and provides less than 20 minutes of flight time. About the GoPro Karma Price is dependent of camera. For example: GoPro Karma + GoPro Hero 5 isn't the same with GoPro Hero 4. However, will cost you an extreme price: $799 (AU$1,195.95), without the camera Hero5. 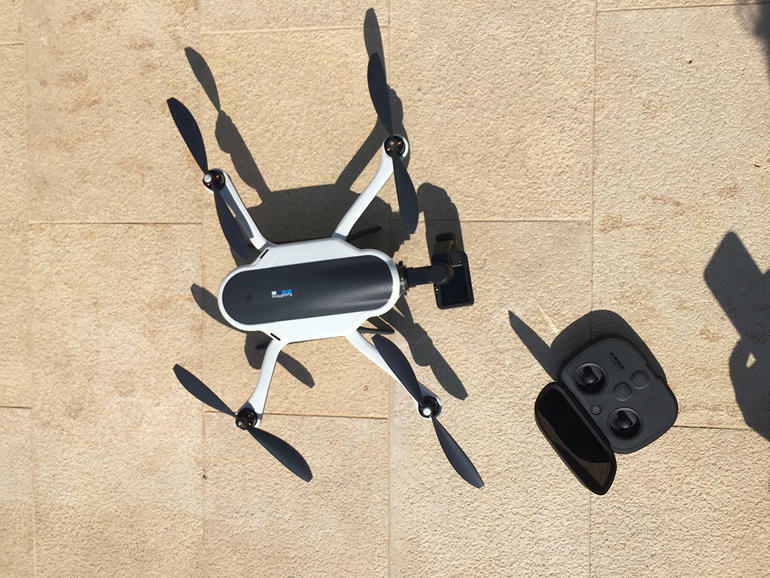 With the Hero5 Sessions, it costs $999 (AU and UK pricing TBA), and the ultimate bundle with the Karma drone plus Hero5 Black is priced at $1099 (AU$1,649.95).